Okay, after some encouragment from a few friends, I'm releasing my deck builder to the public for free to be used as a tool for those who want it to build some awesome decks. This game rocks! Make sure you go and buy your copies The Force Awakens tomorrow and the So Be It Force pack next week! Fantastic. Always appreciate tools like this. The random 4-card objective flop has been added to the Deck Stats tab. If you've downloaded before, you just need to download the *.exe file to get the update. Never really saw much need for a deck builder, especially with this game. But I'll have to check this one out. Erie born resources deserve the chance to earn the Team Erie™ stamp of approval. I made it for two reasons....1) So I could analyze any deck I put into it visually....to better learn what makes up a "good" deck. I originally built this for A Game of Thrones...I just modified it for Star Wars since I already had the basic framework done. 2) Keying all the cards into the database actually helped me learn the cards a bit better than I would have guessed. I don't get the opportunity to play anywhere near as much as I would like, so this was fun and helpful all at the same time. It is in no way meant to replace the awesome online deck builders. It was really just an excuse for me to do some "hobby-coding" with Lazarus. I've been toying with the idea of making a program that can be used for tournaments. Something that would make a TO's life a bit easier when it comes to scoring, swiss-pairing, final cut calculations, etc. Anyway, version 1 is a bit rough. Like I said, it could use a bit more polish, but oh well. It's all for fun! Looking forward to getting in some games with you sometime! I would be VERY interested in some nice tournament software. Knowing the cards goes a long way towards improving your game. Don't hesitate to let us know anytime you're free on a Saturday, were almost always playing either this or LotR. Well, Saturuday is always family day, so that's out for me except the occassional tournament. I have to make my card nights during the week. Holy crap, that was painful (I tried the downloading everything off the drive bit)! I've made the sole file on my google drive a self-installing *.exe file. MUCH EASIER to install on a windows device now. - Added So Be It Force Pack! - Removed the 'Export Decks' and 'Check My Deck!' tabs. Octgn file. Makes changing your Octgn decks ultra-easy. editing or formatting is needed (unless you don't like my format). to the lack of the 1200 image files in the installer. to filter the grid by Released Force Pack or Deluxe Box. Don't know if anyone is still interested in this or not, but as a service to the community and this awesome game, I'll continue it. Press the Attack has been added! FULL_Setup_SWLCG_Deckbuilder.exe is ~511 MB download. For those who've never d/l before. Update_Press_The_Attack.exe is ~7.9 MB download. Just the changed files for the latest Force Pack. Builds, saves and loads Octgn deck files as well as text files. I'd like to find the Lackey file format and add that as well (future to-do). Hey, Janitor, I'm still waiting on that Team Erie™ stamp of approval ('tongue-in-cheek')! I do believe all the bugs have been squashed to date. Hard to say though with my limited pool of QA testers (meaning just me). The tourney software is getting put on the back-burner while I work on my Lord of the Rings offline deck builder. When I'm ready to get to it though, I'm going to look you up and discuss what you'd like to see in said software (assuming you haven't found what you're looking for with what's out there already). Sorry to admit that I still haven't taken a look. I don't think I've had my computer turned on since you originally posted this. It's on my list, I will try to make sure I check it out this week sometime. Definitely interested in seeing something for LotR. Let us know when you want some input. Gamer257, what language did you write this in and do you have any thoughts of providing source code for it? I've toyed with the idea of making a similar tool for other platforms (I'm a mac/linux guy). I've installed the latest version of your awesome deck builder, but there's an issue - i can't choose faction and as a result i can't create any decks. How can i do that? The menu on the left side doesn't work, what am i missing? I wrote it in Object Pascal using the Lazarus IDE. Why? Probably because I'm a professional Delphi developer at my day job and that made it really easy to do in that language. It uses just plain flat text files, as I didn't want to use a RDBMS of any type. I wanted to keep it relatively fast and simple. I didn't want to require a user to install IIS or some other DB management system on their PC if they didn't have it already. I don't mind sharing the source code at all. It's out on GitHub ( https://github.com/C...sLCGDeckbuilder ). Make sure you don't have any of the grid filters selected (hit the Clear Filters button). If you haven't clicked any of the column headers in the grid, then the grid should now be in it's "original" state. With this program the first thing you have to do is pick a faction before you start building your decks. 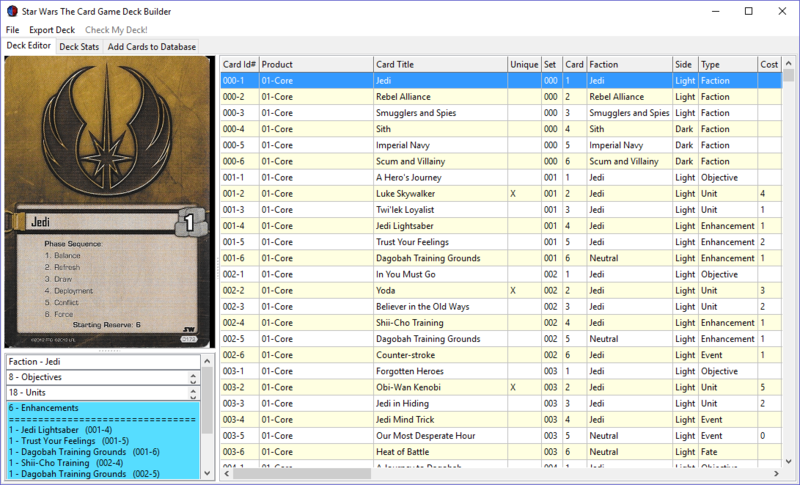 When the program opens up, The faction (affiliation) cards are all at the top of the card grid. You simply have to pick one of those six cards and double-click on it to add it to your deck. A single click will high-light the card and show it in the card view pane. A double-click will put it into the Faction 'bucket' in the lower left deck pane. If it STILL isn't adding it to your deck, let me know and we can troubleshoot the issue for you. I'd need to know what version of Windows you're running and where you installed the program. Windows User Access security sometimes throws a monkey-wrench into things. I tried to explain how to use the software in the ReadMe.txt file. If something in there isn't clear to you, let me know how I might word it better so folks can better understand how to use the app. Thanks! Thank you for explanations! Now it's ok.
Is there any interest in an 'offline' deck builder?